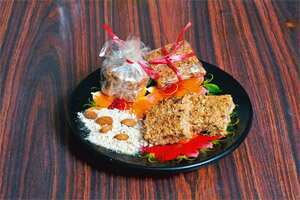 Expensive chocolates, exotic fruits, endless boxes of laddoos—you’ve gifted them all. Don’t your cousins, friends and colleagues also come up with exactly the same, clichéd ideas? This Diwali, be different. 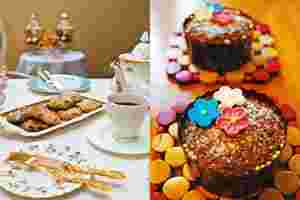 Send out boxes of home-made, easy-to-bake desserts. Preheat the oven to 165 degrees Celsius. With a hand mixer, mix butter, both the sugars and flour until the lumps disappear. Now, add the chopped chocolate and knead well. Dust the table with flour. Roll the dough to about 1cm thickness. Cut into desired shapes, like stars, hearts or circles. Bake at 165 degrees Celsius for 12-15 minutes, until golden brown. Let them cool completely and then dust on the icing sugar with a sieve. Assorted decorative sprinkles, sugar balls, etc. 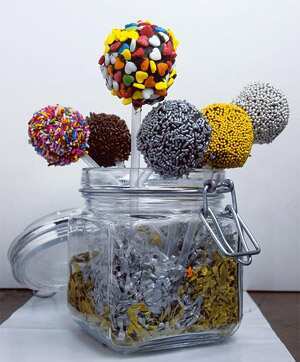 For each lollipop, take 100g of cake and 50g of icing. Mix them together in the palm of your hands and roll together to form a ball. Once rolled, place in the fridge for 10 minutes. Then insert the straw into the ball right to the very end, so that the ball does not fall off. Then dip into the melted chocolate to form a thick coating on the ball all the way till the straw. When still moist, sprinkle with toppings and place in the fridge to set. Repeat the process to make more lollipops. Place in a glass jar with shredded gold paper or marbles, etc., and present as a bouquet. Preheat the oven to 175 degrees Celsius. Line an 8x8-inch pan with parchment paper—place the sheet in such a way that two ends stick out. This aids in lifting the baked slab out afterwards. Lightly grease the parchment paper and the exposed pan. Stir together all the dry ingredients, including the fruit and nuts. In a separate bowl, whisk together the vanilla, melted butter or oil, liquid sweeteners and water. Toss the wet ingredients with the dry (and peanut butter, if you’re using it) until the mixture is evenly crumbly. Spread in the prepared pan, pressing the mixture in firmly so that it moulds to the shape of the pan. Bake for 25-30 minutes, until brown around the edges. If it looks soft and almost under-baked, do not worry—it’ll set once cool. Cool in the pan completely on a cooling rack. Once cool, use a serrated knife to cut 2x2-inch bars or use cookie cutters to get the desired shapes. If the bars still seem crumbly, chill in the fridge for 30 minutes. To store, wrap the bars individually in plastic or stack them in an airtight container. In humid weather, it’s best to store bars in the refrigerator. They also freeze well. —Recipe courtesy Samruddhi Nayak and Nina Subramani, Whisk and Whip, Indiranagar, Bangalore (adapted from the King Arthur Flour blog). Gayatri Jayaraman, Komal Sharma and Pavitra Jayaraman contributed to this story.